Photos courtesy of Gage Skidmore and the National Archives and Records Administration. Images have been edited by the author. Republican presidential candidate Mike Huckabee's August campaign trip to Israel challenged longstanding U.S. policy towards Israel and the Palestinian territories. Speaking at a press conference in Jerusalem, the former governor of Arkansas rejected the notion that Israel "occupied" the Palestinian territories of Gaza and the West Bank and that Israeli settlements in those territories were "illegal" under international law. "I don't see it as occupied," Huckabee told journalists August 19. "That makes it appear as if someone is illegally taking land. I don't see it that way." Calling "Samaria"--Israeli lexicon for the West Bank--as much of a part of Israel as Manhattan is a part of the U.S., Huckabee reiterated his past statements that a two-state solution (a longtime feature of American policy in the region) is "unrealistic and unworkable." As a Republican candidate for president, it is valid to evaluate just how far Huckabee's positions on the Israeli-Palestinian conflict diverge from historical and contemporary U.S. foreign policy. To demonstrate, one could compare these statements to Ronald Reagan's positions on the subject. 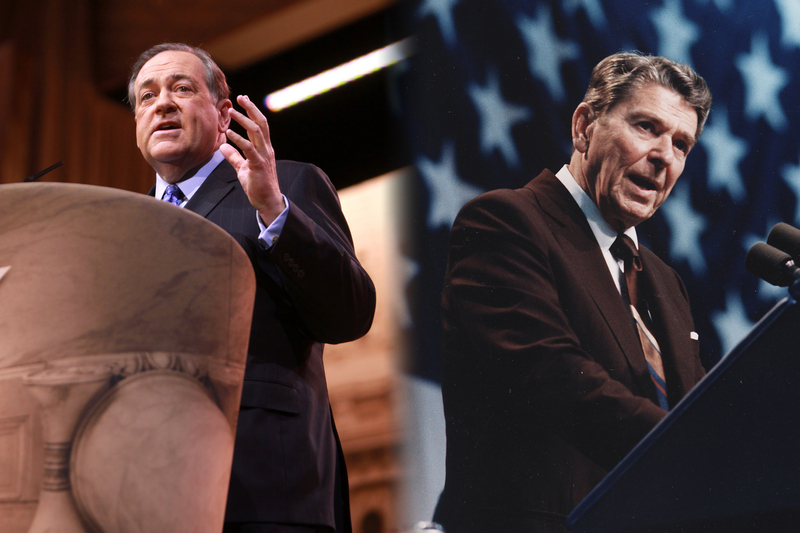 Indeed, Reagan is the optimal candidate for this evaluation, not only because the former president was lauded by Huckabee as a "prophetic [voice] for freedom and opportunity," but because Reagan's positions (compared to other recent U.S. presidents) most closely approach Huckabee's own. Like a potential President Huckabee, Reagan departed from the policies of his predecessors by no longer referring to Israeli settlements in occupied Palestinian territory as illegal under international law--a claim long disputed by Israel. Specifically, this is in reference to Article 49 of the Fourth Geneva Convention, which forbids any "Occupying Power" from "[deporting] or [transferring] parts of its own civilian population into the territory it occupies." Reagan, nevertheless, chose to refute this assertion. "As to the West Bank," the newly-minted president told reporters in 1981, "I believe the settlements there--I disagreed when the previous Administration referred to them as illegal--they're not illegal." Yet Reagan, unlike Huckabee, did not support their construction or expansion, calling the efforts "unnecessarily provocative." Indeed, as part of his 1982 peace plan for the Israeli-Palestinian conflict, Reagan called for an immediate settlement freeze to "create confidence" and stated that further construction "only diminishes the confidence of the Arabs that a final outcome can be freely and fairly negotiated." These policies have endured, and subsequent U.S. peace efforts have consistently called for such freezes, as demonstrated by the George H.W. Bush Administration's 1991 letter of assurance to the Palestinians, which continued to call the settlements "an obstacle to peace." While the Obama Administration ultimately dropped the demand of a settlement freeze as a precondition to talks, the resumption of Israeli settlement activity effectively scuttled talks early in his presidency, as Palestinians disputed that Israel was negotiating in good faith. However, Huckabee appears to be confounded by these historical contentions, saying at his recent Jerusalem press conference, "It is interesting to me that our government has often put more pressure on the Israeli government to stop building bedrooms in their own neighborhoods, than they put on Iran to stop building bombs." Not pausing to address the accuracy of that claim, it nevertheless demonstrates the difference between Huckabee and Reagan's positions. The distance between the two widens at the issue of Israel's occupation of the Palestinian Territories. While Huckabee (as quoted above) rejects the notion that Israel occupies this land or that it was taken illegally, this flies in the face of international law--including the U.N. Charter--and stated U.S. policy. Following Israel's 1967 seizure of Gaza and the West Bank, the U.S. joined the U.N. Security Council in unanimously adopting Resolution 242, which cited the "inadmissibility of the acquisition of territory by war" and called on all parties to respect and acknowledge "the sovereignty, territorial integrity and political independence of every State in the area" as required by Article II of the U.N. Charter. Furthermore, the resolution called upon Israel to withdraw its "armed forces from territories occupied" in the conflict. Despite its change in rhetoric regarding Israeli settlements, the Reagan Administration continued to embrace Resolution 242, with the president calling it "wholly valid as the foundation stone of America's Middle East peace effort." Moreover, his administration voted for U.N. Security Council Resolution 497 in December 1981, which reaffirmed that "the acquisition of territory by force is inadmissible, in accordance with the United Nations Charter, the principles of international law, and relevant Security Council resolutions," decided that Israel's move to "impose its laws, jurisdiction and administration in the occupied Syrian Golan Heights is null and void and without international legal effect," and determined that the Fourth Geneva Convention continued to apply to the territory, which had (like the Palestinian Territories) also been occupied by Israel since 1967. Israel's Supreme Court has even described the West Bank as "under belligerent occupation." In fact, former President George W. Bush did not shy from saying that it was "untenable for Palestinians to live in squalor and occupation." Huckabee disagrees with them all. Finally, Huckabee rejects the longstanding American support for a two-state solution as "unrealistic and unworkable," though the candidate declined to outline any ideas as to the status of Palestinians under such a framework. While Reagan might generally agree to this statement, he still strove to grant Palestinians a measure of opportunity in determining their future. Interestingly, while Reagan also rebuffed the creation of an independent Palestinian state, he called the self-government of the Palestinian people within the context of an enlarged Jordanian state "the best chance for a durable, just, and lasting peace." However, the idea to have Jordan administer an autonomous Palestinian territory was ultimately rejected by Israel, Jordan, and the Palestinians. Subsequent American presidents have largely adhered to the course set by Ronald Reagan. Some substantial innovations have been made, but these were nevertheless consistent with historical positions regarding the problematic issue of Israeli settlements and the envisioned self-rule of the Palestinian people. Indeed, these issues were largely the basis of the compromise reached in the Oslo Accords, which created the Palestinian National Authority in exchange for security concessions for Israel. However, a potential Huckabee presidency would appear to undo decades' worth of progress. Such a dramatic shift in policy might come under strong criticism. Were he alive today, one of those detractors could potentially be Ronald Reagan himself.